Spicy dill pickle sour beer! 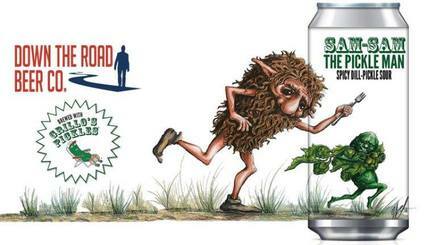 Down The Road Beer Co. is collaborating with Grillo’s Pickles on Spicy Dill-Pickle Sour Beer! Introducing: Sam-Sam The Pickle Man, a spicy dill-pickle sour beer made with real pickle brine. True pickle aficionados know that the brine is just as important as the cukes, inspiring some enlightened souls to drink that salty, spicy vinegar goodness directly from the jar.